I didn’t have to twist my daughter and son’s arm to get them on-board the Carnival Miracle destined for Hawaii. This was their 6th open-ocean cruise so they knew the drill. 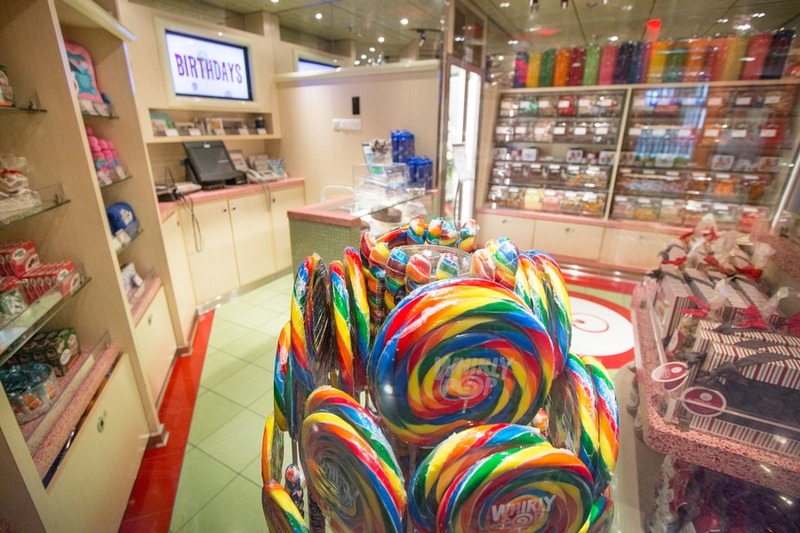 The buffets, the soft service ice-cream dispenser, the hot tubs and of course, kids club. 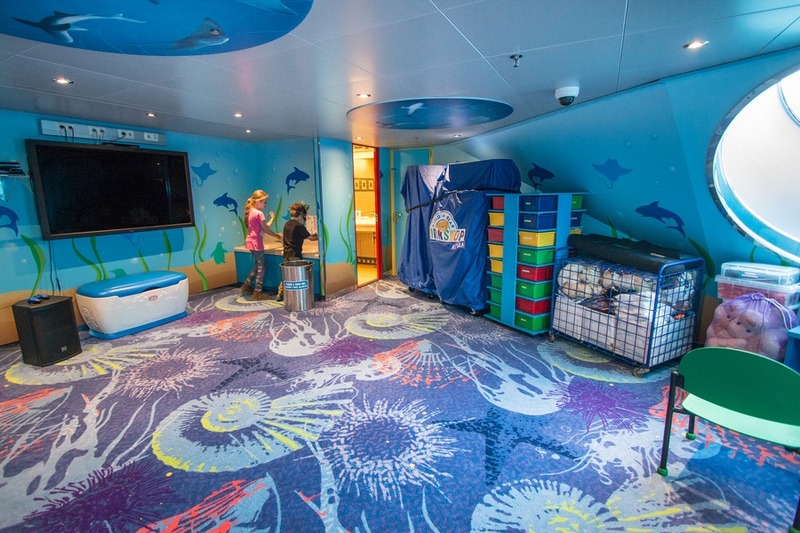 But what exactly is it about cruising with Carnival to Hawaii that children love so much? I asked them, and the answer wasn’t just one or two things… it was 27! Regardless of how many amazing sites my children visit around the world, they still love a well-organised kids club. At the time, they were both aged in the “Stingrays” group (6-8 yrs), so they not only got to play with each other but lots of new friends. Each day was structured so there’s plenty of fun to be had, but enough free time for them just to be kids. Activities included: team games, dress-ups, video games, crafts, story time, movies and much more. We even took part in a hilarious family scavenger hunt around the ship. Every time I came to pick up Mia and Caius, they asked if they could stay longer. That’s pretty much the highest compliment a child can give to the Camp Ocean team. 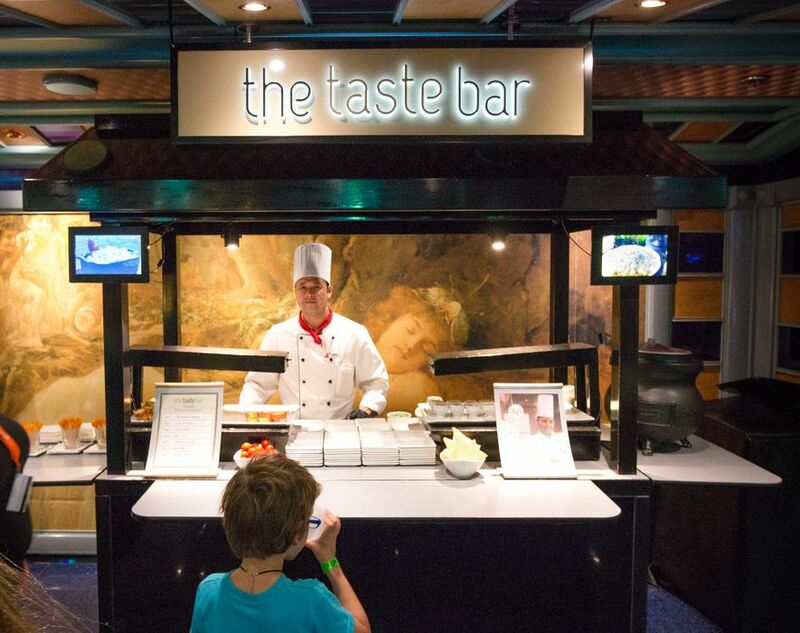 With a vast array of savoury and sweet options all over the ship, kids will never go hungry. 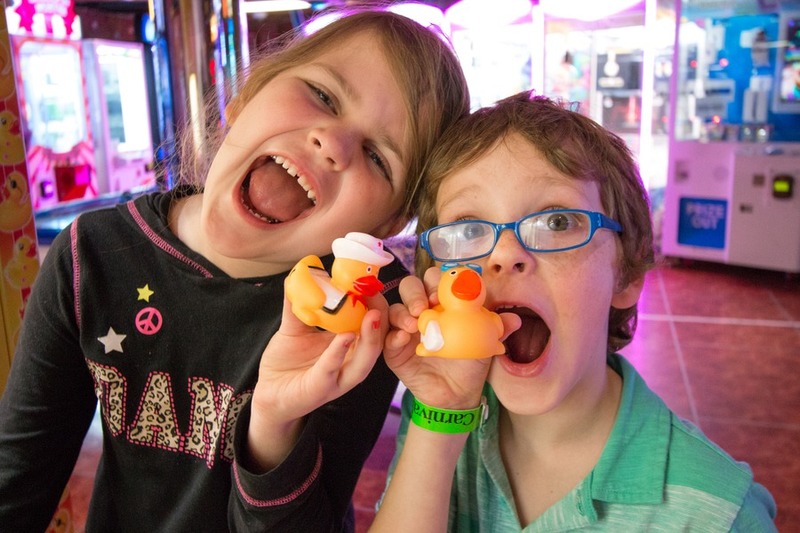 Mia’s favourite eatery was Off The Grill near the pool on Lido deck which served up delicious cheeseburgers, while Caius couldn’t go past freshly cooked pizzas at Pizza Pirate (open 24 hours a day). Of course, any time they walked past Swirls, it was the right time for ice cream (yep, 24 hours a day too). 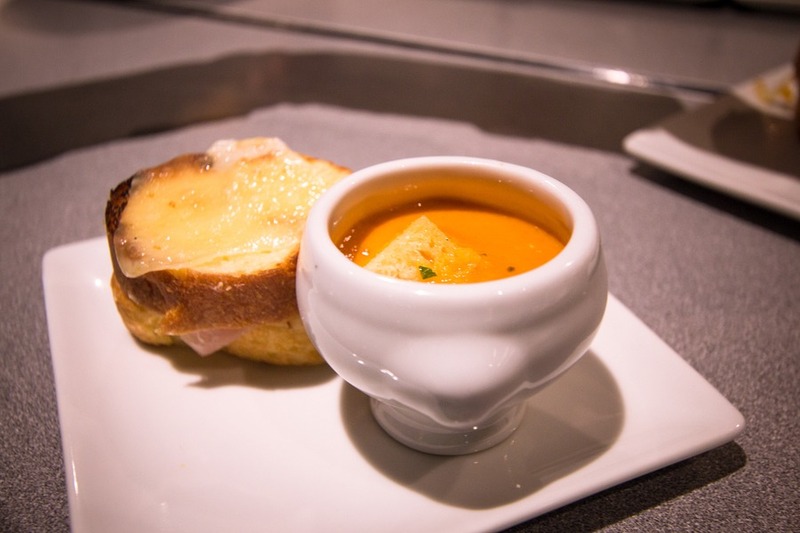 Lido Restaurant offered up a variety of cuisines each day: Italian, Asian, American, deli sandwiches, salads, and more. 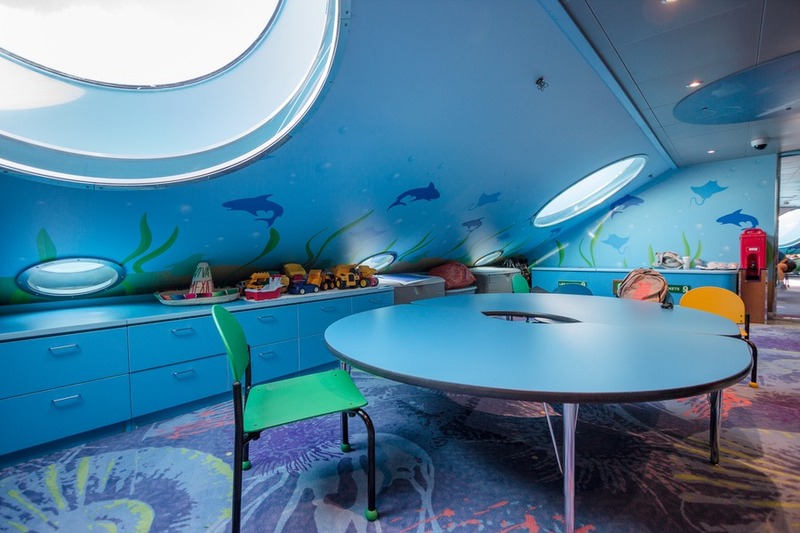 If we wanted to leave the kids in Camp Ocean during dinner, they were taken by staff to Lido in a secured seating area where they could enjoy special kid-friendly meals. 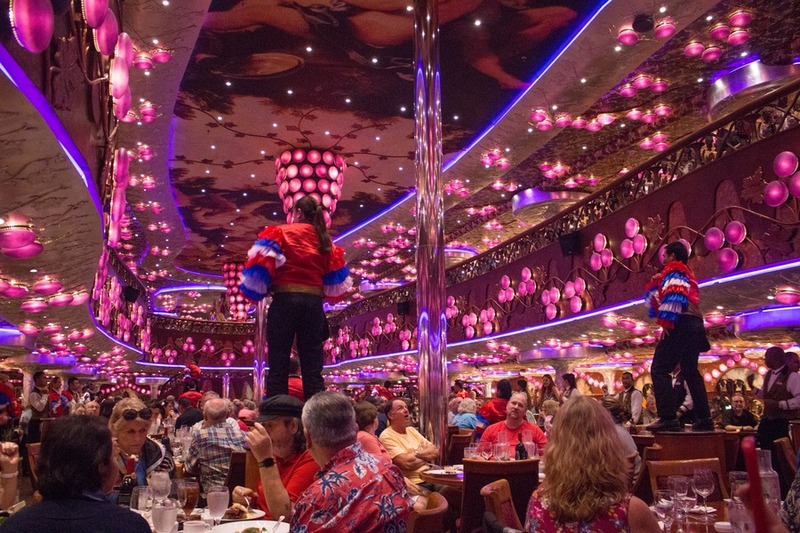 Dinner on board a Carnival cruise is always a special event in the Dining Room. On the Miracle, we ate nightly at the Bacchus Dining Room during “early dining” (starting at 5:30pm). I recommend booking “early dining” as far advanced as possible, as the late dining times aren’t the best for younger kids. Our friendly waiter, Darryl, got to know each family member, their food preferences, and eventually became part of the family. 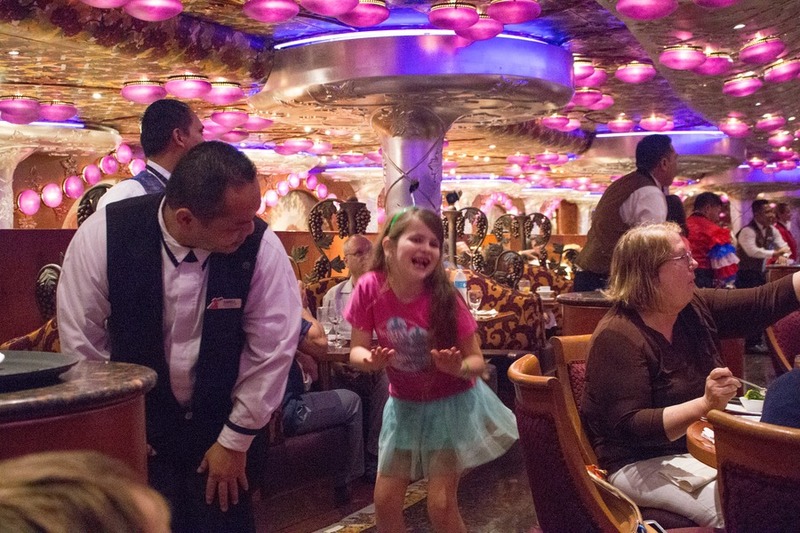 If your kids love a certain dish, your waiter will remember. It’s the attention to detail that impressed both kids and adults alike. Alternatively, you can choose “Your Time Dining” for additional flexibility but you don’t have the same wait staff each night which is my kids’ favourite aspect. Most parents tell their kids not to leave the table until everyone has finished eating. But each night in Bacchus Dining Room, there was a special reason my daughter was allowed to excuse herself early… to join the team dance! Between special costumes, upbeat music and an infectious joy, I couldn’t help but even join in too. My son watched on with a big smile cheering his big sister. If your kids find it hard to get out of bed, then let them enjoy their vacation too! We tried 24-hour room service a few times. Almost all the same favourite dishes were available that were found in Lido (plus a few extras). If we couldn’t fit in dessert during dinner at Bacchus, the wait staff were more than willing to deliver the dessert to the stateroom later. Mia and Caius looked forward to sampling something new each day at The Taste Bar – unique small plates featuring creative combinations of flavours from all over the world. This was a clever way for them to try new food without having to order a whole plate (in the unlikely event they didn’t like it). Fortunately, every sampler was a winner. 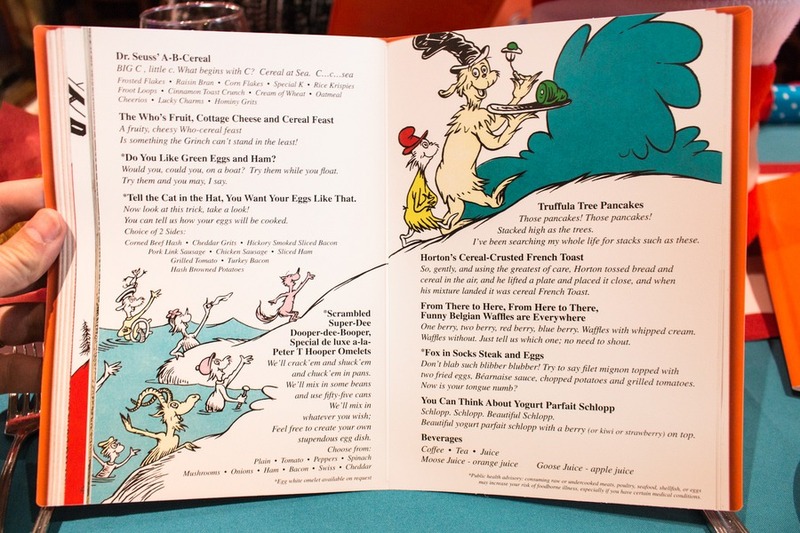 On the last dining-related point, our kids adored the Dr Seuss inspired menu for the Green Eggs and Ham breakfast. 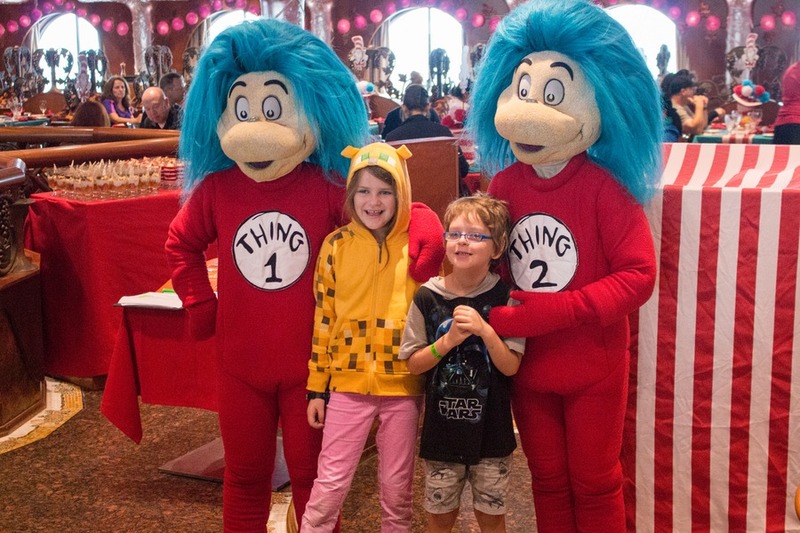 The wacky theme overflowed beyond the menu to the décor and even whimsical in-costume characters from Dr Seuss’ books roaming the dining room. It only cost an extra $5 (for both kids and adults), but the kids agreed it was definitely worthwhile. Does this pancake stack look a little like a certain cat’s hat? 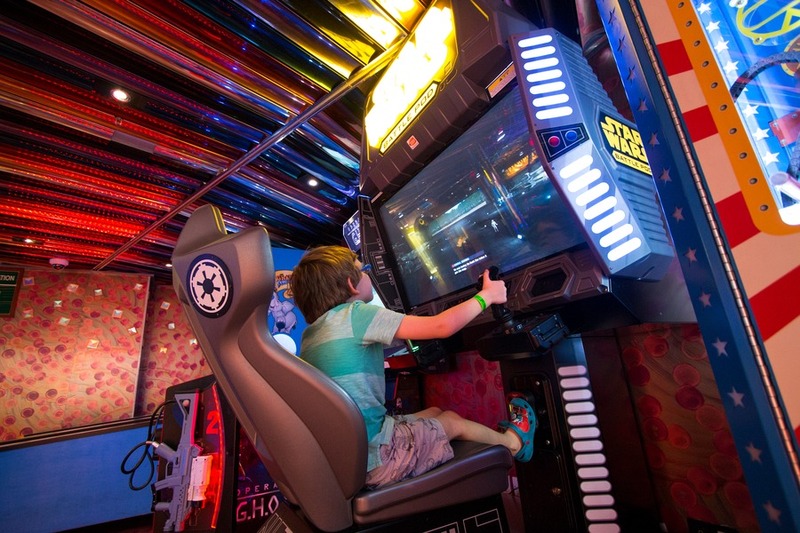 A room full of flashing lights, whizzing sounds and action-packed video games… how can any child resist? My kids are big fans of video game arcades anywhere in the world, and this one was no different. Credits for gameplay are stored on a special swipe card which can be topped up so you can limit your child’s spend (a very smart idea). I’m not quite sure exactly what it is about bunk beds that appeals so much to youngsters. Maybe it’s the ladder to climb into bed, or being higher than everyone else. But I can’t deny the popularity. The fold-down bed in our stateroom quickly received dibs by my daughter, while my son took the lower bed. Now this is a real vacation! Mia and Caius relished in the fact that they didn’t have to make their beds or tidy up the stateroom every day. Our very friendly room steward took such good care of us. And the cute towel animals that greeted the children every evening never failed to put a smile on their faces. No need to keep the bathroom tidy? That’s a vacation! 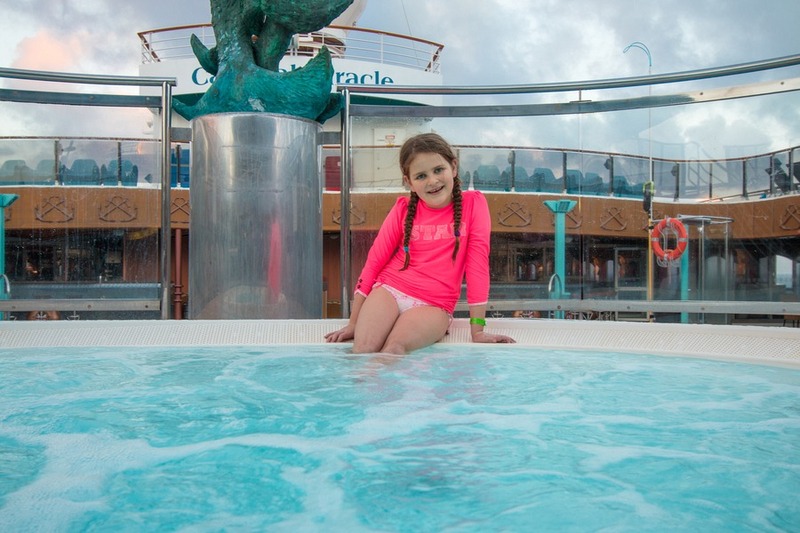 If your kids love swimming as much as mine do, then they’ll be as happy a pig in mud on the Carnival Miracle. With several sea days on this 15-day cruise to Hawaii we had plenty of opportunities to make the most of the ship’s pools and hot tubs. Take water fun to the next level… literally! My kids slid down the Twister waterslide over and over again. 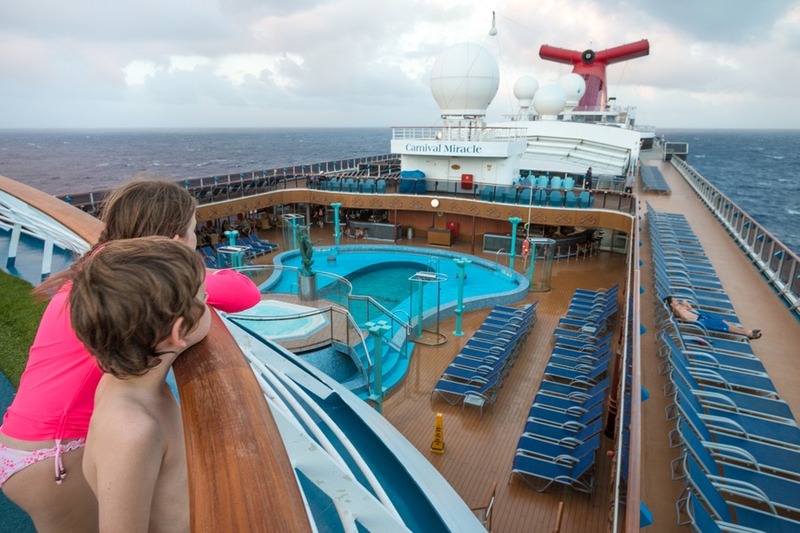 Tip: bring your towel along as it can get breezy on the top decks of the ship. Boomshakalaka! Play a game of HORSE or perhaps a little 1-on-1 in the netted basketball court on Sports Deck (#11). While most evenings the kids wanted to be in Club Ocean, we managed to pry them away for a few shows in Phantom Main Show Lounge which included dance, a magician and even a ventriloquist. Imagine your favourite board games and now increase their size to larger than life. This sums up the fun our kids had at Hasbro, the game show. Mia joined in to play CONNECT 4 BASKETBALL and won an awesome prize. These are board games of the regular-sized variety. Located in the Joker Card Room, we played cards, CONNECT 4, Uno, Battleship and more. Perfect for those sea days. Want a bigger challenge? The giant-sized chess board near the pool was the scene of many epic showdowns. One evening the children came back from Camp Ocean looking like pirates. Shiver me timbers! Arghhhh! Better give him all the treasure… just in case. Inspired by the cute creations that magically appeared on our beds each evening, Mia embarked on a journey of self-discovery to bring out her inner towel animal. ;-) Our Cruise Director led a fun workshop for all ages to learn the craft of converting an ordinary-looking towel into an adoring creature. On the Carnival Miracle, miracles do happen! One morning the kids watched a cute performance by Towel Animal Theatre where towel animals come to life. The characters were adorable and the storyline suited children of all ages. 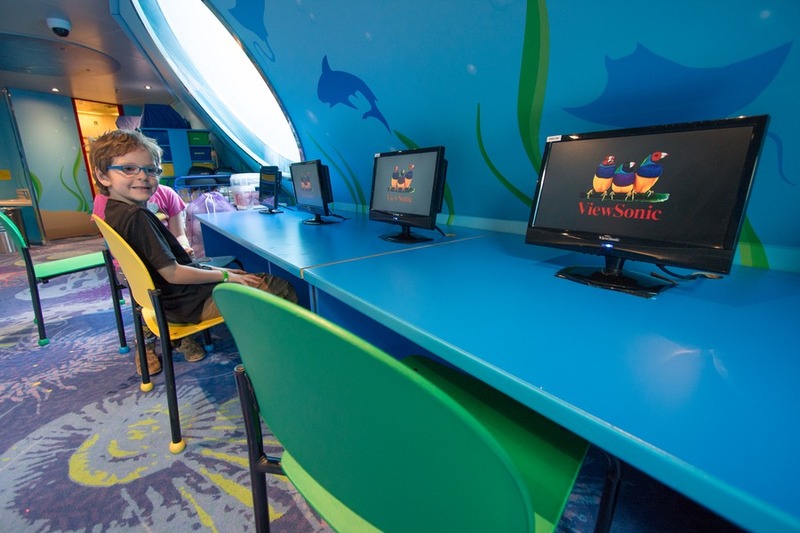 The quirky world of Dr Seuss comes to life for children throughout the cruise. In addition to the breakfast (above) and a character parade, the Seuss-A-Palooza story time shared a well-loved story but with a special twist (I won’t’ spoil the surprise!). 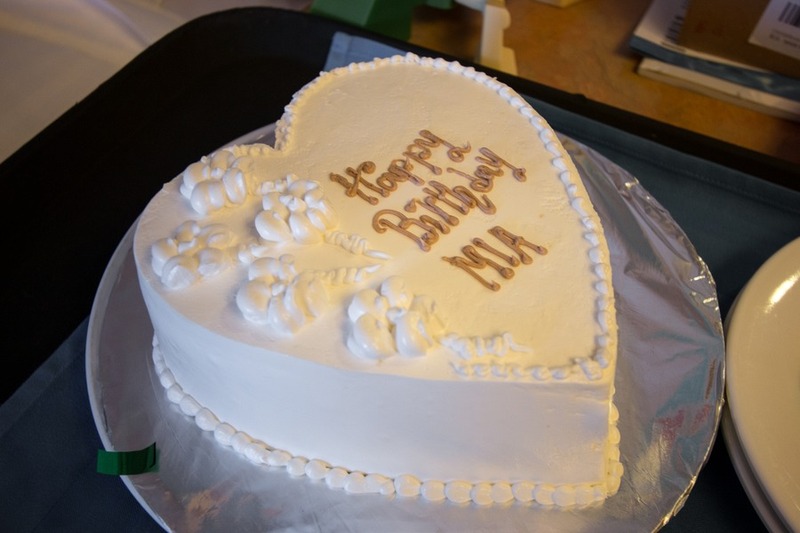 We celebrated Mia’s birthday on the Miracle with cake and candy from on-board shop, Cherry on Top. They organised to have the cake delivered to the dining room at a specific time and Mia was thoroughly thrilled. 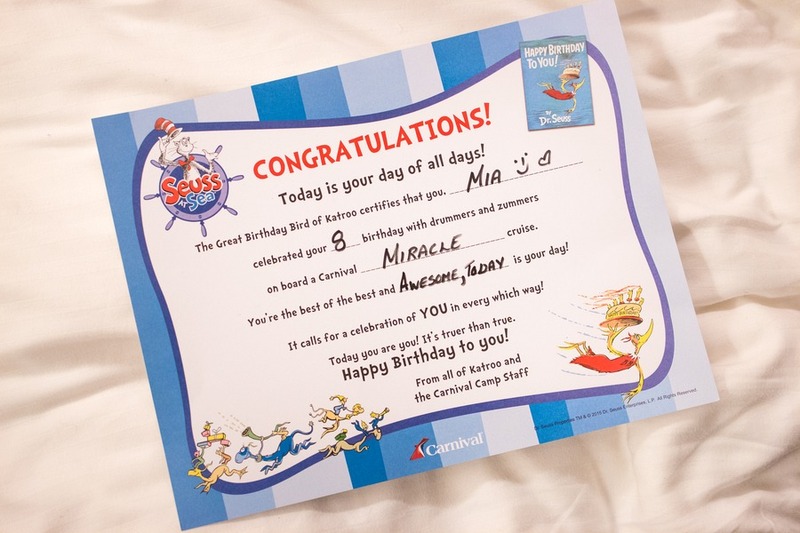 The lovely folks in Camp Ocean also gave Mia a cute birthday certificate to commemorate the special day. We cruised in early December, so Carnival decked the halls with boughs of holly. The kids were part of a special seasonal show in front of a packed audience. Mia even got a chance to sing solo during one of the carols! You go girl! 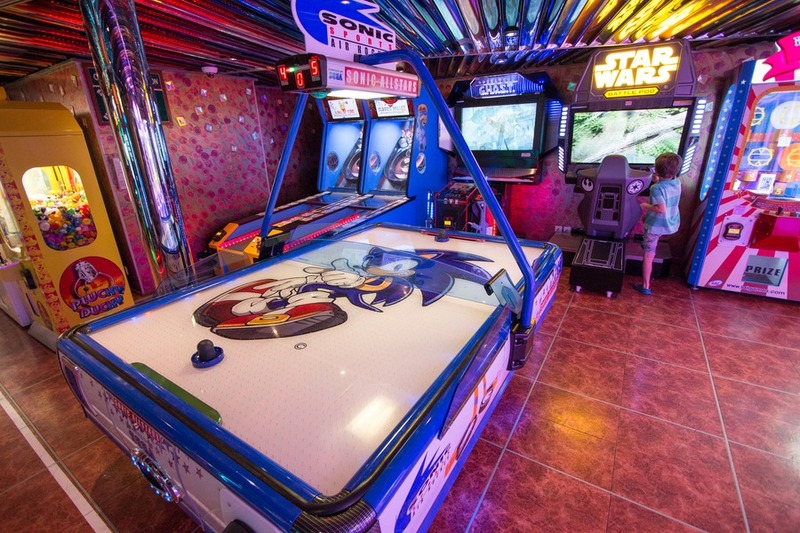 While staying on the cruise ship is fun, there’s also plenty of action for kids off the ship. We couldn’t cruise to Hawaii without experiencing a traditional luau at Old Lahaina Luau in Maui. 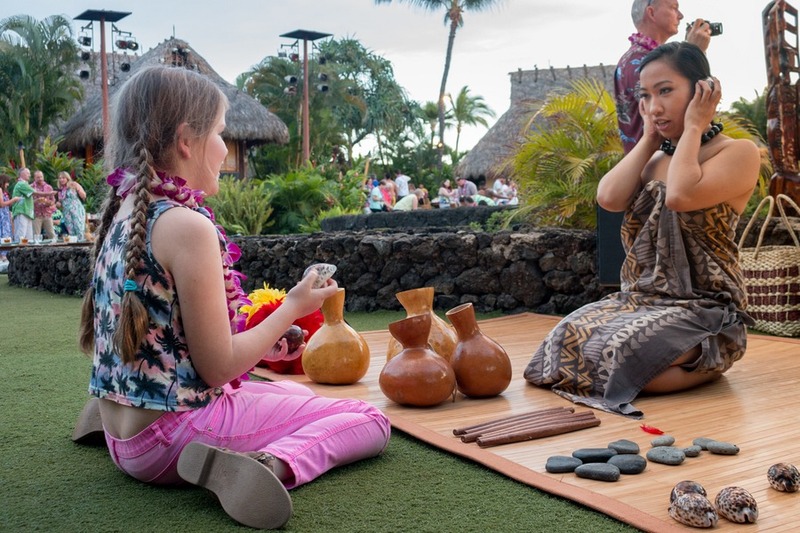 The kids learned Hawaiian dances, tried musical instruments, enjoyed a delicious roast pig, and watched an amazing world-class show featuring dancers, songs and mythology. 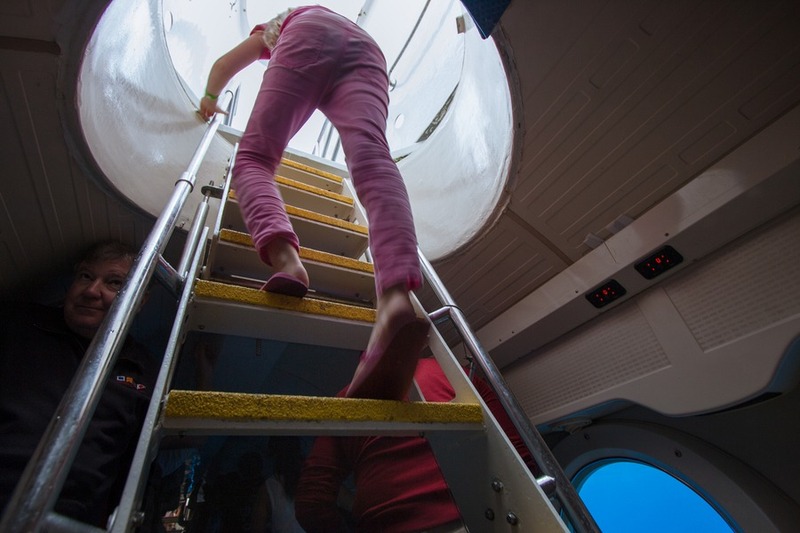 It’s not every day our kids get to dive 100 feet below the ocean’s surface in a fully functioning submarine. 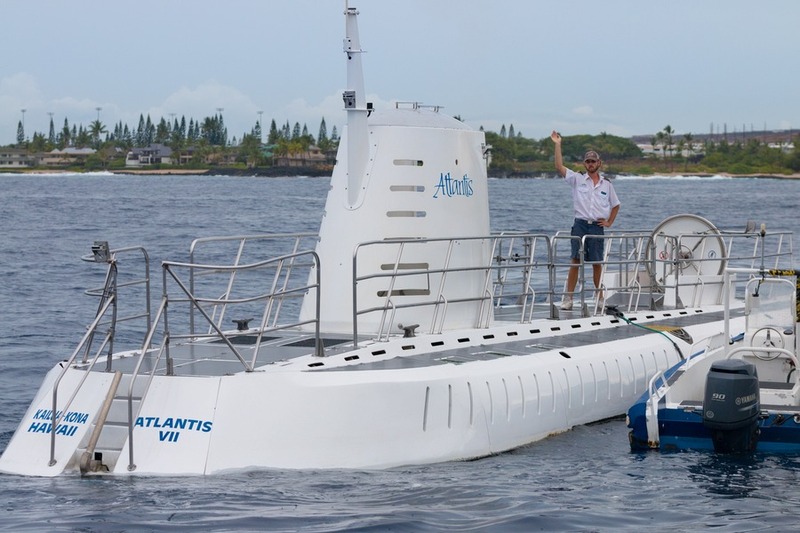 So, they savoured the opportunity to take the Atlantis Submarine Tour in Kona, Big Island. Mia and Caius were able to identify hundreds of fish with the help of a laminated picture guide, and spotted humorous “haunted” shipwrecks on the ocean floor. The comical guide kept the giggles rolling in during the entire 45-minute tour. This scored a hearty 2 thumbs up by both children. Don’t worry, they’re plastic skeletons! For just a few dollars in Kona we tried the classic Hawaiian treat of shaved ice. Sure, you might be able to find snow cones in other locations, but this is different… the ice is shaved, not crushed. My 8-year-old food connoisseur could tell the difference. Apparently, the flavours sit in the ice rather than sinking to the bottom of the cup. All I know is that it tastes awesome! And finally, kids can’t cruise to Hawaii without enjoying the picturesque beaches! Youngsters will be happy to play for hours in the yellow sand and gentle waves at Kalapaki Beach in Kauai (near Nawiliwili cruise ship terminal). Just remember to bring along the sunscreen and towel. Hey Erin, loved this post! There's something very unique about travelling (and sleeping) on a cruise ship. Looks like you and your children had an amazing time. I've given you a follow as I also write a travel blog! You have represented the enjoyment of Hawaii in a post. I appreciate your work. My kids are both sad and happy by watching your pictures. They egarly want to visit Hawaii. But I am not sure about safety issues there. Love these smiling faces! We travel with the kids, too, and they are always so much fun. We loved Hawaii and hope to get back to see more of the islands. We visited the big island.